15.7 bhp @ 8500 rpm and 13.1 nm of torque @ 6500 rpm. TVS claims the pickup 0-60 kmph in under 4.8 seconds while the 0-100 kph reading is covered in 17.7 seconds. The top speed claimed is 120+ km/hr. Apart from the FI the bike also gets blue black digital console, racy stripes on the body and disc brake at the rear. 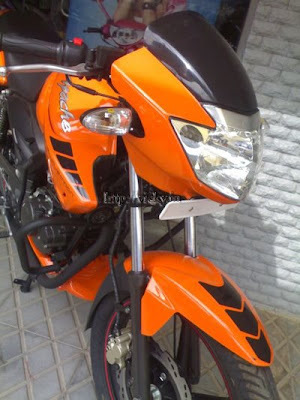 The bike has been priced at Rs 64,990 Ex-Showroom Delhi and comes in two pastel shades - orange and yellow.